The plasma drill, also called a mining laser, is the sole armament of the Harvesters used by the post-war Covenant. It is primarily used as an excavation tool for the purposes of recovering Forerunner artifacts, although it is also utilized as a weapon. 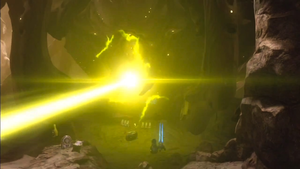 The plasma drill fires a single greenish-yellow energy beam, similar to that of a focus cannon. At full power, the beam is capable of drilling through multiple layers of solid rock. ↑ Spartan Ops, Episode 10, Chapter 5: "One Last Time"